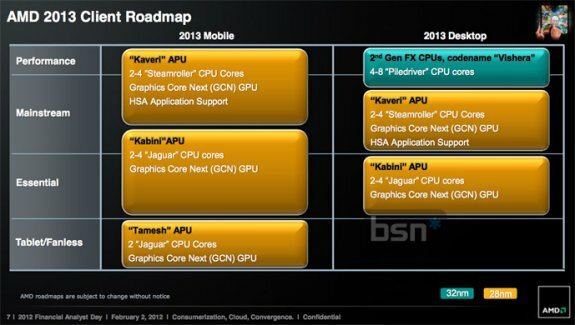 Bright Side of News takes a look at what's on AMD's roadmap for tomorrow, you can read the analysis over here. Supply issues on the 32nm node can now be considered a thing of the past. The executives explained that there have been constant improvements in yields allowing them to meet customer demand. While not giving detailed guidance about the improvements being made, the CFO remarked that AMD "we are not any longer supply limited on that node". For the coming quarter, incremental yield improvements are expected. During the call it was revealed, that during the second half of 2012, tape-outs and also the production of 28nm APU products will commence at GlobalFoundries, having a slightly negative impact on gross margin. Some of these chips will be sold for revenue even in 2012. This is done in preparation for launches in early 2013.